Two concurrent Los Angeles exhibitions afford a worthwhile opportunity to learn something new and unexpected about a pair of familiar artists who both offer a viewing lens defined by color. Alexander Calder, best known for his polychromatic kinetic mobiles, is represented at Hauser & Wirth by a survey of mobiles, standing mobiles, stabiles and maquettes almost exclusively painted black. Betye Saar, whose assemblages are usually considered in terms of their social and political implications, presents a four-decade survey of collages and assemblages at Roberts Projects in which the dominant color is blue. 'Black' is not the first attribute that one thinks of when describing Calder's art, which is characteristically described as "kinetic" and "colorful." In 2009, for example, the San Jose Museum of Art organized a Calder exhibition drawn from Bay Area collections and subtitled "Color in Motion." Just last year, the Phoenix Art Museum mounted a survey of the artist's lithographs, titled "Alexander Calder: An Outburst of Color." By contrast, the Hauser & Wirth selection, titled "Calder: Nonspace," sheds light on a relatively unexplored side of Calder. The title rests on a term that originated in a 1963 essay by the novelist James Jones, who wrote of the artist's belief in giving equal weight to space and 'nonspace,' by which he meant 'negative space.' To reinforce the idea of keeping solids and voids in perfect balance, which Calder would have enthusiastically embraced, designer Stephanie Goto created a beautifully staged environment for the gallery. The works vary in scale and were created over the course of several decades (five outdoor sculptures are also installed on the grounds). Although some of the indoor works hang from the ceiling while others are on white platforms or shelves, the overall effect is incredibly harmonious when taken as a whole. With the absence of bright colors, with the exception of a couple of works that are hidden from view as one enters the gallery, the exhibition is itself an elegant composition in black and white (walls and platforms), a reductive palette that enables a fuller appreciation of Calder's mastery over rhythmic lines and graceful shapes. 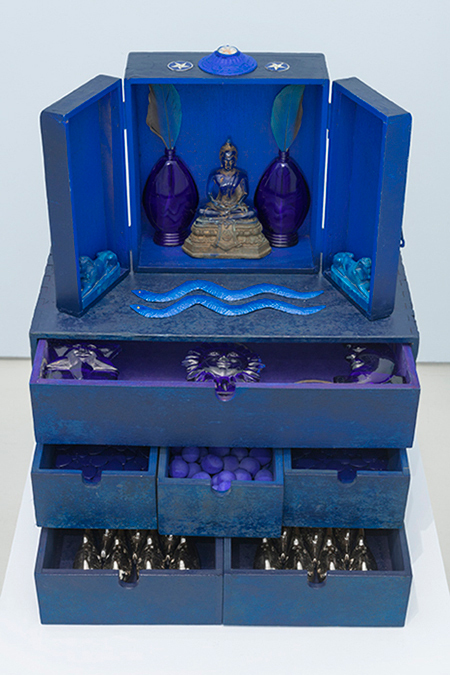 "Betye Saar: Something Blue" is the artist's second recent exhibition to focus on objects sharing an emphasis on a particular color. For her 2011 exhibition "Betye Saar: Red Time," also at Roberts Projects (then it was Roberts & Tilton), Saar painted the gallery walls red, and organized red-dominant collages and assemblages chronologically into thematic sections on mysticism and spirituality, political and social concerns, and the artist's personal memories. Reinforcing Saar's belief that the objects she recycles into art possess certain 'energies' from their pre-aesthetic lives, the overall temperament of that installation was hot and fiery, with many of the specific elements symbolizing or expressing such qualities as love, passion, pain and power. For the "Something Blue" installation, Saar left the gallery walls white, which encourages us to spend more time with each object. In mixed-media collages from the 1980s, blue is employed as a background color that sets a mood, ranging from ominous to cheerful, for narratives that unfold from constructing meanings suggested by objects scattered across her compositions. In the more recent birdcage assemblage "Evening in Paris" (2010), a joyful sentiment towards "the city of lights" is conveyed by sparkling blue glass objects: a perfume bottle, a replica of the Eiffel Tower and a human hand, the latter a frequent reference to the artist herself. In the majority of works, ritualistic shrines are made by arranging objects in boxes or by compartmentalizing them within window frames. The prevalence of blue sets a tone of solemnity and peacefulness. Several new assemblages comprised of found objects associated with different world religions — including Buddha figures, crosses, candles and sacred hearts — reflect Saar's ongoing interest in art's shamanistic power. This dates back to the 1970s when she first learned about African art and traveled to Haiti, where she witnessed voodoo rituals. Perhaps Saar's assemblages did perform a timely bit of magic, summoning spirits needed to conjure up the recent electoral "blue wave."